The new provisional government stamps of Ireland continued through the end of 1922, when Ireland then became a free state within the British Commonwealth of Nations. These provisional stamps were created by the overprinting of contemporary British stamps by various contracting companies. All of the British stamps overprinted between July and December 1922 used the two Great Britain watermarks shown above. All of the denominations from the 1/2 P. through the 1 S. have WMK 033, and all the denominations from the 2 S. 6 P. through the 10 S. (the so-called "Seahorses") have WMK 034. The differences in these provisional stamps of Ireland are in the overprint types, and they will be explained in the following reviews of each group of stamps. 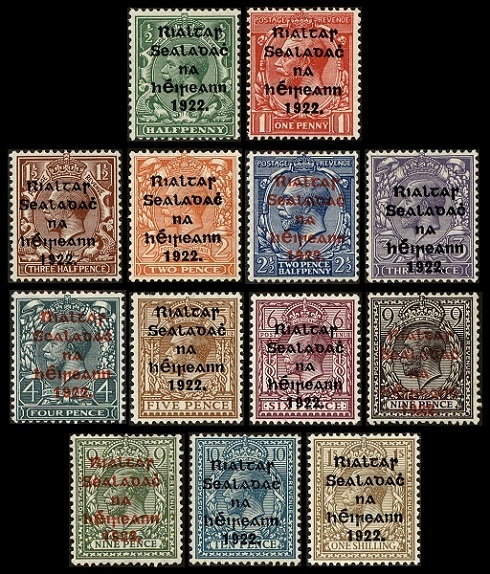 The thirteen provisional government stamps of Ireland shown above were issued between July and November 1922. The overprint means "Irish Provisional Government". This group of stamps was overprinted in bluish black or red by Alex. Thom & Co., and the overprint measures 14 1/2 x 16 mm. 00 1/2 P. (1922 - Sc. #23) - Green. 01 P. (1922 - Sc. #24) - Scarlet. 01 1/2 P. (1922 - Sc. #25) - Red Brown. 02 P. (1922 - Sc. #26) - Orange. 02 1/2 P. (1922 - Sc. #27) - Ultramarine. 03 P. (1922 - Sc. #28) - Violet. 04 P. (1922 - Sc. #29) - Slate Green. 05 P. (1922 - Sc. #30) - Yellow Brown. 06 P. (1922 - Sc. #31) - Red Violet. 09 P. (1922 - Sc. #32) - Black Brown. 09 P. (1922 - Sc. #33) - Olive Green. 10 P. (1922 - Sc. #34) - Light Blue. 01 S. (1922 - Sc. #35) - Bister. The 2 P. denomination exists with an inverted overprint. 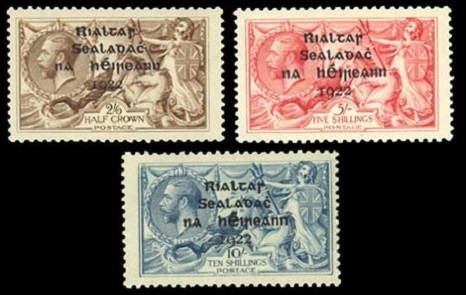 The three provisional government stamps of Ireland shown above were issued during 1922. This group of stamps was overprinted in bluish black by Alex. Thom & Co., and the overprint measures 21 x 13 1/2 mm. The "h" and "é" are 1/2 mm. apart. 02 S. 06 P. (1922 - Sc. #36) - Brown. 05 S. (1922 - Sc. #37) - Carmine Rose. 10 S. (1922 - Sc. #38) - Gray Blue. 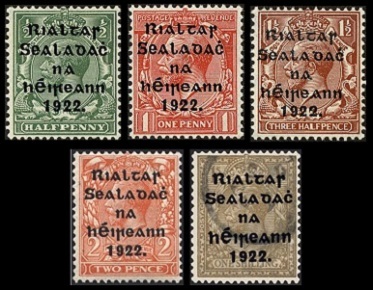 The five provisional government stamps of Ireland shown above were issued in December 1922. This group of stamps was overprinted in bluish black by Alex. Thom & Co., and the overprint measures 15 3/4 x 16 mm. 00 1/2 P. (1922 - Sc. #39) - Green. 01 P. (1922 - Sc. #40) - Scarlet. 01 1/2 P. (1922 - Sc. #41) - Red Brown. 02 P. (1922 - Sc. #42) - Orange. 01 S. (1922 - Sc. #43) - Bister. 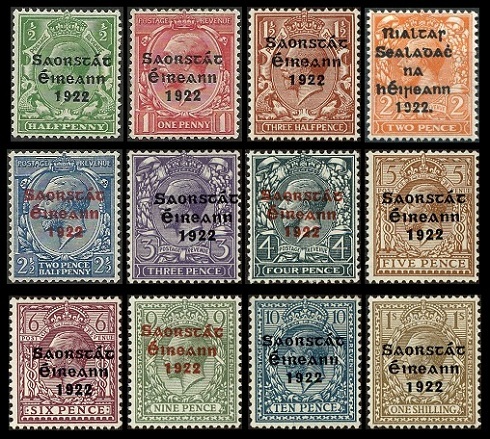 The twelve provisional stamps of Ireland shown above were issued in December 1922. The overprint means "Irish Free State". This group of stamps was overprinted in bluish black or red by Alex. Thom & Co., the overprint measures 15 x 8 1/2 mm., and the "1922" is 6 1/4 mm. long. 00 1/2 P. (1922 - Sc. #44) - Green. 01 P. (1922 - Sc. #45) - Scarlet. 01 1/2 P. (1922 - Sc. #46) - Red Brown. 02 P. (1922 - Sc. #47) - Orange. 02 1/2 P. (1922 - Sc. #48) - Ultramarine. 03 P. (1922 - Sc. #49) - Violet. 04 P. (1922 - Sc. #50) - Slate Green. 05 P. (1922 - Sc. #51) - Yellow Brown. 06 P. (1922 - Sc. #52) - Red Violet. 09 P. (1922 - Sc. #53) - Olive Green. 10 P. (1922 - Sc. #54) - Light Blue. 01 S. (1922 - Sc. #55) - Bister. Most of the stamps in this set exist with overprint errors. Please see the major catalogs for details. 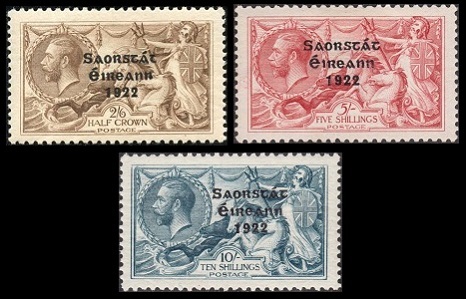 The three provisional stamps of Ireland shown above were issued during 1922. The overprint means "Irish Free State". This group of stamps was overprinted in bluish black by Alex. Thom & Co.
02 S. 06 P. (1922 - Sc. #56) - Brown. 05 S. (1922 - Sc. #57) - Carmine Rose. 10 S. (1922 - Sc. #58) - Gray Blue. These stamps exist with overprint errors. Please see the major catalogs for details. The four provisional coil stamps shown above were issued in Early 1923. This group of stamps was overprinted in black or bluish black by Harrison & Sons. These stamps were produced both in horizontal and vertical coil rolls. The perforations are often clipped. In the Harrison & Sons overprints, the "e" of "eireann" is a bit above the line of the other letters, making the word look curved. 00 1/2 P. (1922 - Sc. #59) - Green. 01 P. (1922 - Sc. #60) - Scarlet. 01 1/2 P. (1922 - Sc. #61) - Red Brown. 02 P. (1922 - Sc. #62) - Orange.